With great power comes great capability, and Ford is promising all of that and more on the updated F-series Super Duty lineup. The Blue Oval has released the first details on the 2020 models of its heavy-duty pickup trucks, which Ford says will have the most powerful engines and the highest payload and tow ratings in Super Duty history. While the company remains mum on the official power and torque output as well as the towing capacities-at least until later this week at the Chicago auto show-we expect both to exceed the Super Duty's current 935 lb-ft of torque and 35,000-pound maximum towing capacity. In addition to the increased torque output and hauling capability, the refreshed Fords also receive a new heavy-duty variant of Ford's 10-speed automatic transmission, chassis enhancements, more high-tech features, and subtle exterior and interior revisions. Until the all-important torque and towing ratings are released, the big news is that the Super Duty will now offer two gasoline-powered V-8 engines. Along with the standard 6.2-liter V-8, which carries over unchanged, an all-new 7.3-liter V-8 will be available. Ford claims it will be the most powerful gas V-8 in its class. This all-new engine marks the return of a pushrod V-8 to Ford products, but seeing as it features a cast-iron block, we don't think this will spark the return of a big-block Mustang. The 7.3 also features variable valve timing, port fuel injection, cross-bolted main bearings, and a forged-steel crankshaft, a combination aimed at simplifying maintenance and maximizing reliability. The company's legendary Power Stroke diesel engine is also significantly overhauled for 2020, with the 6.7-liter V-8 adding an upgraded fuel-injection system that is said to optimize combustion and control noise levels. Other meaningful enhancements include a redesigned turbocharger and stronger internal components for more horsepower and torque than the previous diesel engine, which developed 450 horsepower and 935 lb-ft. While that torque rating is already higher than the Duramax diesel (910 lb-ft) that is available on the heavy-duty Chevrolet Silverado and GMC Sierra, the all-new Cummins diesel found in the Ram 3500 makes up to 1000 lb-ft of torque. Based on recent history, we expect Ford to exceed that number. All three Super Duty engines will be available with the new 10-speed automatic transmission, which replaces the current six-speed automatic. Ford says this heavy-duty trans has a wider gear-ratio span than the old six-speed and is only 3.5 pounds heavier while not taking up any more space under the truck. Unlike the 10-speed autos found in the F-150, this version gets a power takeoff, often referred to as a PTO, that can power accessories including job-site generators, snowplows, and salt spreaders. While huge towing capacities and massive torque ratings grab headlines in heavy-duty-truck land, these behemoths are also judged by how luxurious their cabins are and how fancy their high-tech options are. Accordingly, the 2020 Super Duty receives new driver-assistance technology, upgraded infotainment options, and updated exterior and interior features. 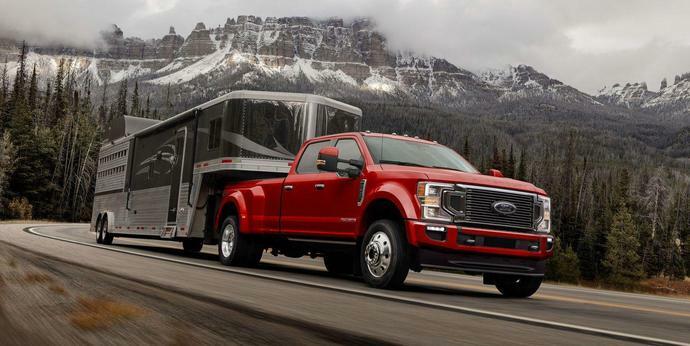 The Super Duty lineup continues to offer a variety of driver assists such as automated emergency braking, blind-spot monitoring, and lane-keeping assist. It's also now available with a useful Pro Trailer Backup Assist. The system allows the driver to hook up a variety of trailers by helping them control the steering and using the camera system to give further guidance. Every model also includes a 4G LTE connection with a mobile hotspot that connects up to 10 devices; wireless charging and USB-C ports are also now available. The heavy-duty Fords may have a host of significant updates underneath their aluminum-intensive shell, but the exterior and interior revisions are milder. On the outside, they feature a slightly revised front end with updated LED headlights and a new front bumper. The rear end has also been refreshed with a new bumper, tailgate, and taillights. Inside, the improvements are basically limited to premium materials and options on specific models. Expect the updated Super Duty lineup to go on sale this fall, with the base price for a rear-drive, regular-cab F-250 to be about $35,000.